Have you ever had risotto in an Italian restaurant? It’s a soft and creamy rice dish with tons of flavor. Strangely enough, there’s no cream in it usually. It’s made with a short grain rice that has a lot of starch in it. The constant stirring while cooking breaks down and mixes with the liquid while it cooks. You end up with a crazy good texture. I’m one of those kitchen people that just hates to babysit food while it cooks. I love to eat, but I don’t have time to watch things like a hawk let alone stir endlessly for 20-30 minutes. In my quest to somehow get risotto without the effort, I’ve tried crock pot risotto with lots of success. I’ve also tried cauliflower risotto that was pretty good. The two had nothing on my latest and greatest. I splurged and got myself an Instant Pot! OMG, please insert jazz hands, flapping, squealing and jumping at this kitchen gadget. I know, I know. You may have no clue exactly what I’m talking about so let me explain. Back in the good old days, people used pressure cookers to quickly cook certain foods under the pressure of steam. My grandmother had one. It was the poor man’s answer to cheap cuts of meat and beans. The pressure would somehow tenderize that shoe leather texture piece of meat and bake your beans in a fraction of the time. Kinda like the opposite of a slow cooker. Enter the current technology advancements and you’ve got the totally overhauled, push button miracle worker – the Instant Pot – which is basically an electronic pressure cooker. The one I got has some neat features like saute, steaming, and a few other things in addition to pressure cooking. I’ve tried it for several things so far including risotto. 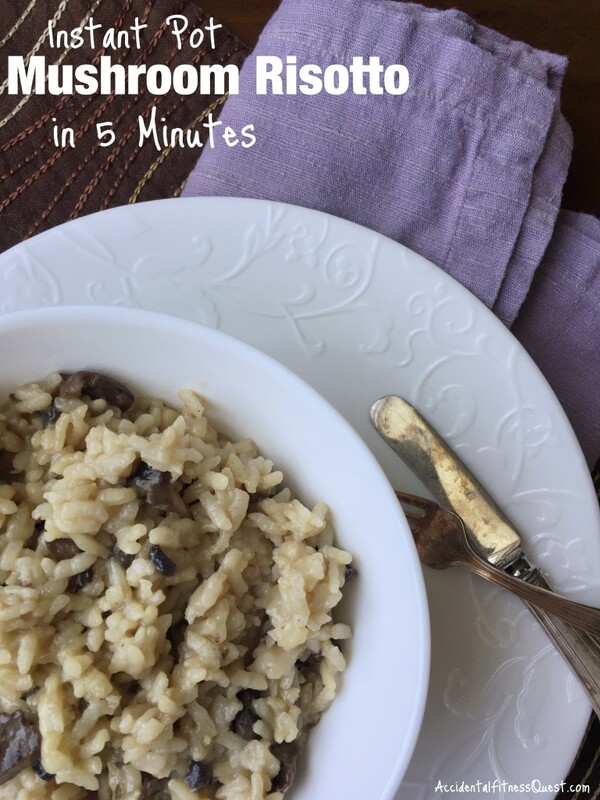 Not just any risotto, but risotto in FIVE MINUTES. Yes, what the what?! I seriously fell over myself in my rush to get into the kitchen when I realized this. No stirring, no babysitting, no waiting. Hello, dream machine. So needless to say I whipped up a mega-batch of The Kid’s favorite mushroom risotto. Turn on the saute feature on your Instant Pot or heat your stove top pressure cooker over medium heat. Add the oil and swirl to coat the pan. Add the onions and cook for about 3 minutes until translucent. Add the minced garlic and cook another minute. Add the dry rice and stir to mix the rice into the oil and onion mixture to coat the rice well. Pour in the broth and add the mushrooms. Give it a quick stir to combine. Place the lid on the pressure cooker and heat to full pressure. Cook for 5 minutes at full pressure. At the 5 minute mark, turn off the Instant Pot or remove the stove top pressure cooker from the heat. Cover the release with a towel and use the quick release feature to completely release the pressure right away. Make sure to avoid the steam and don’t burn yourself. Once the pressure is fully released, carefully open the pot and stir. Makes 6 servings at approximately 235 calories – 9g protein, 43g carbs, and 3g fat. Yes, they still make stove top pressure cookers that you can use for this recipe. I haven’t used one personally but the timing should be identical once fully pressurized. Make sure to follow the instructions for your specific pot on how to do that. No regrets here on getting the electronic version which makes it pretty dummy proof for someone like me. I’m looking forward to playing around with a few more recipes and seeing what other wonders it holds. The pressure’s on!